Urogenital tract mucosa defense depend on specific soluble epithelial cell-derived mediators such as Tamm-Horsfall protein (THP), soluble IgA, lactoferrin, lipocalin, constitutive and inducible bactericidal antimicrobial peptides (AMPs) such as α- and β-defensins and cathelicidin1. β-defensins are produced by renal epithelium, and α-defensins by the infiltrating neutrophils during UTIs. They have a direct antimicrobical activity, killing bacteria, but also enhancing innate responses by causing mast cell degranulation, by promoting neutrophil chemotaxis and by recruiting naive T cells and immature dendritic cells. Also cathelicidins are AMPs containing a highly conserved signal sequence and pro-region (“cathelin”), but show substantial heterogeneity in the C-terminal domain that encodes the mature peptide. The only isolated human cathelicidin has C-terminal 37-amino-acid mature peptide and is termed LL-37 or hCAP-18. LL-37/hCAP-18 is secreted by skin, respiratory and urothelial epithelia. In addition to the ability of LL-37/hCAP-18 to kill microorganisms, peptides derived from it bind to lipopolysaccharide (LPS). The human cathelicidin peptide LL-37 is chemotactic for neutrophils, monocytes, mast cells, and T cells; induces degranulation of mast cells; alters transcriptional responses in macrophages; stimulates wound vascularization and re-epithelialization of healing skin. Lactoferrin and lipocalin restrict the availability of iron, an essential microbial nutrient. 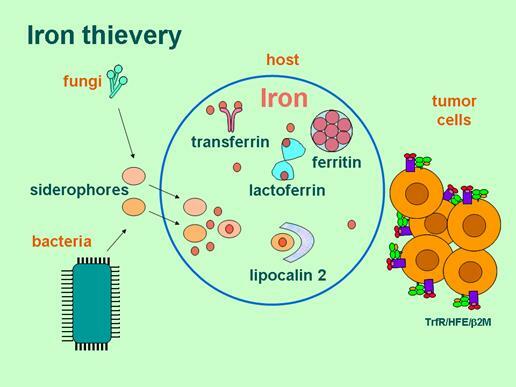 Lactoferrin damages microbes both by chelation of iron and by affecting membrane integrity. Lipocalin is designed to capture the iron-laden organic siderophores that bacteria utilize to scavenge iron from the environment. Tamm-Horsfall protein (THP) is selectively produced by the thick ascending limb of the Henle. It contributes to bacterial elimination from a mechanistic point of view by adhering to specific mannosylated residues on uropathogenic bacterial fimbriae , preventing attachment and thus promoting bacterial urinary wash-out. It has also an immunomodulatory role by activating innate immune cells such as dendritic cells via a TLR4-dependent mechanism. If the soluble mediators fail to completely kill and wash-out the invading pathogen, the innate inflammatory response is initiated in order to eliminate the invading microbes: uroepithelial cell produces inflammatory mediators, like IL-6, IL-8, that are chemotactic signals for neutrophils, that cause local destruction and elimination of bacteria through antimicrobial peptides and reactive oxygen. The innate defence is played by the family of TLRs, essential to recognize microbial products in mononuclear phagocytes and to regulate inflammatory process and adaptive immunity (not really understood). TLR4 controls the earliest steps of the mucosal response towards UPEC, leading to chemokine and cytokine production. TLR2 stimulates tubular cells to produce inflammatory mediators, as TNF- α. TLR5 has been recognized as a specific TLR against bacterial flagellin. TLR11, with mechanisms not yet well identified, should develop a function in the prevention of UTIs. Also kidney seems to have an active role to maintain homeostasis against bacterial invasion. In fact, increasing concentration of renal vasopressin would tend to inhibit the local immune response and favour the bacterial colonization by ascending uropathogens. Such situations could account explain, at least in part, the high frequency of UTI in elderly patients, who are particularly susceptible to dehydration. Furthermore, signalling mediators such as cyclic adenosine monophosphate (cAMP) was shown to be involved in the defence of uropathogenic microbes and maintenance of mucosal integrity. Last but not least weapons against infections are the flow of urine, its low pH and high osmolarity. Hydrogen ion secretion is mediated either by sodium-hydrogen exchange, an electroneutral and secondary active process, or by hydrogen ion secretion, a directly electrogenic and primary active process. Extrusion of hydrogen ions across the apical cell membrane is accompanied by electrogenic bicarbonate transfer across the basolateral cell membrane. Both luminal and peritubular pH exert a strong influence upon acidification by altering the gradient against which hydrogen transport or base exit occur. In the distal nephron, both hydrogen ion secretion and bicarbonate secretion may occur. These transport operations have been shown to be mediated by subgroups of intercalated cells in which hydrogen pumps and bicarbonate-chloride exchange processes are located either in the apical or basolateral cell membranes2. All these mechanisms can be used to prevent and treat UTIs3. For example, inhibition of adhesion and invasion of uropathogenic E. coli might be an achievable goal via disruption of the interaction between CD44 and UPEC in the bladder. Moreover, antibodies to β1-/β3-integrins might inhibit invasion and thus infection of E. coli. Along these lines, inhibition of CD46-receptor/C3-ligand interaction could pose a new strategy for interrupting the cycle of reinfection due to intracellular bacteria. On the other side, the role of adaptive immunity is not clear now, maybe in future systemic vaccination protocols might be realized against UPEC like fimbrial proteins4. 1 Weichhart T, Haidinger M, Hörl WH, Säemann MD: Current concepts of molecular defence mechanisms operative during urinary tract infection. Eur J Clin Invest 2008 Oct;38 Suppl 2:29-38. 2 G. Giebisch: Mechanisms of renal tubular acidification. Journal of Molecular Medicine Volume 64, Number 18 / September, 1986. 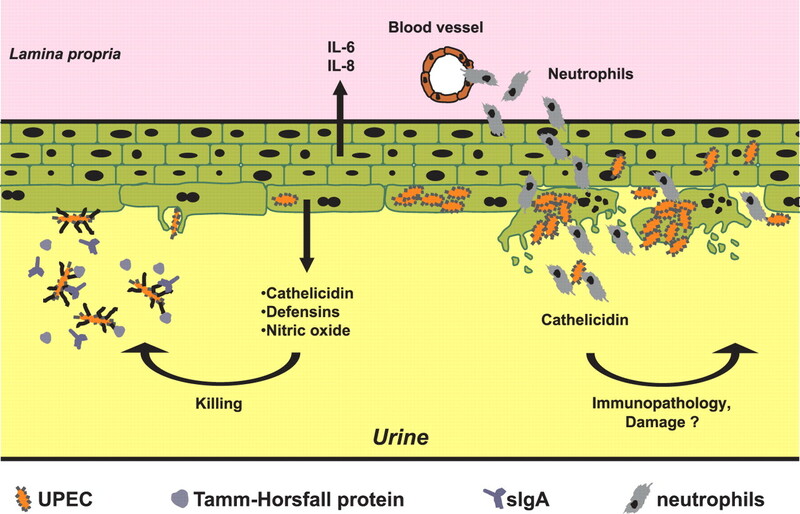 3 Mak RH, Kuo HJ: Pathogenesis of urinary tract infection: an update. Curr Opin Pediatr. 2006 Apr;18(2):148-52. Schematic view of iron transport regulation. Two transporters (DMT1 and ferroportin 1) are essential in duodenal enterocytes for the iron uptake from foods. Ferroportin 1 is also a receptor for hepcidin, a peptide hormone secreted by hepatocytes. The interaction blocks the function of ferroportin 1 as iron transporter. Catechol-Fe(III) complex was recently proposed as non-transferrin-bound iron in the serum, which is recovered by lipocalin 2 . Catechol may come from plants as foods. This ternary complex is redox-inactive and taken up by lipocalin 2 receptor (megalin) of the renal proximal tubules to give back to the serum transferrin system. Ferroportin 1 is the iron exporter from most of the cells, but there is no route of iron disposal to outside of the body. TF, transferrin; TFR1, transferrin receptor 1.